Opti-Dri technology transfers moisture away from the body to keep you cool and dry. 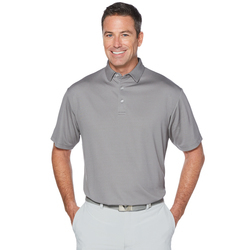 Ventilated fabric allows air to ﬂow freely through the fabric to keep you comfortable. Rib knit collar. 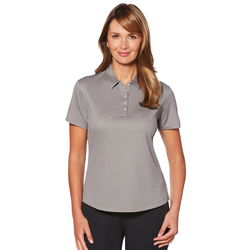 6-button placket with Callaway embossed buttons. Double needle hemmed bottom with side vents. Heat seal label provides tag-free comfort. Contrast embroidered Chevron on back neck. Opti-Dri technology transfers moisture away from the body to keep you cool and dry. 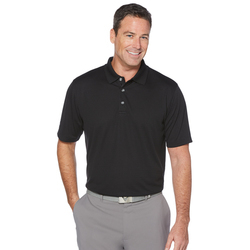 Ventilated fabric allows air to flow freely through the fabric to keep you comfortable. Rib knit collar. 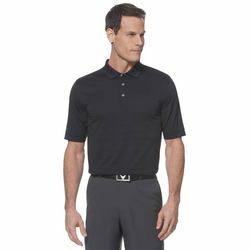 3-button placket with Callaway embossed buttons. Double needle hemmed bottom with side vents. Heat seal label provides tag-free comfort. Contrast embroidered Callaway logo on right sleeve. Opti-Dri technology transfers moisture away from the body to keep you cool and dry Opti-Shield technology creates a layer of UPF 15+ sun protection Rib knit collar 6-button placket with Callaway embossed buttons Double needle hemmed bottom with side vents Heat seal label provides tag-free comfort Contrast embroidered Chevron on center back neck. Opti-Dri technology transfers moisture away from the body to keep you cool and dry Opti-Shield technology creates a layer of UPF 15+ sun protection Rib knit collar 3-button placket with Callaway embossed buttons Double needle hemmed bottom with side vents Heat seal label provides tag-free comfort Tonal embroidered Callaway logo on right sleeve. Opti-Dri technology transfers moisture away from the body to keep you cool and dry. UV Repel technology keeps skin safe from the sun's harmful rays. UPF 15+. Self fabric collar. 3-button placket with Callaway embossed buttons. Double needle hemmed bottom with side vents. Heat seal label provides tag-free comfort. Tonal embroidered Callaway logo on right sleeve. 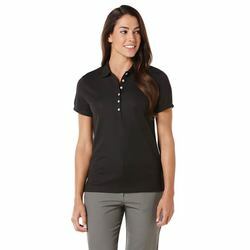 Opti-Dri technology transfers moisture away from the body to keep you cool and dry — UV Repel technology keeps skin safe from the sun’s harmful rays —UPF 15+ — Self fabric collar — 5-button placket with Callaway embossed buttons — Rounded bottom with double needle stitching and side vents — Heat seal label provides tag-free comfort — Contrast heat seal Callaway logo on back neck. Opti-Dri technology transfers moisture away from the body to keep you cool and dry. Opti-Shield technology creates a layer of UPF 15 protection from the sun’s harmful rays. 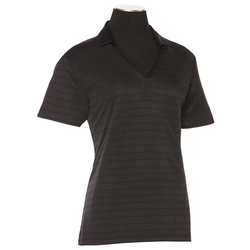 Jersey knit collar and placket with 3 bartacks. Double needle hemmed bottom with side vents. Heat seal label provides tag-free comfort. Tonal embroidered Chevron on center back neck.